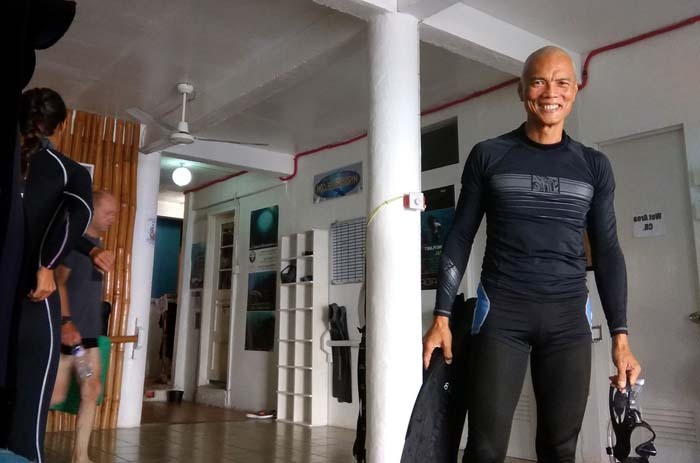 Jean-Pol Francois (JP) has over 27 years of freediving experience and has taught top athletes to be on top of their game. He holds some national and world records and remains an active competitor and member of the Belgian National Team. His personal best is 94m on a sled. To put this in perspective, that's like the height of a 28-storie building! In a world championship competition in Egypt, he met Jacques Mayol, 8-time No-Limits world champion. His career highlight was swimming with the dolphins in the wild for 20 minutes going to depths of 15m. 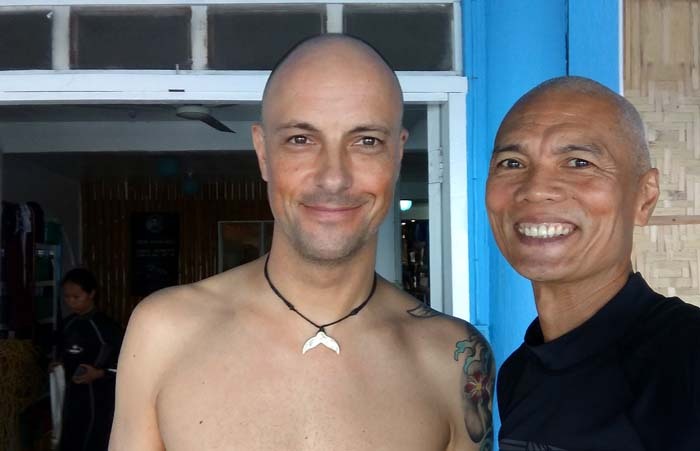 Now in Moalboal with his freedive shop, Freediving-Planet, I get to learn from the teacher himself. I showed up at 8:45am as instructed. After filling-up a few forms, I got geared-up with my own gear and ready to go. I always use my normal snorkeling fins, but JP gave me freediving-specific fins to use - the long narrow ones that have become increasingly popular lately. This is also the first time I had a lanyard for the buoy line. I had a little apprehension using new gear I'm not accustomed to, but I appreciate it as the proper gear. As my former yoga teacher once said, "adapt or perish!". 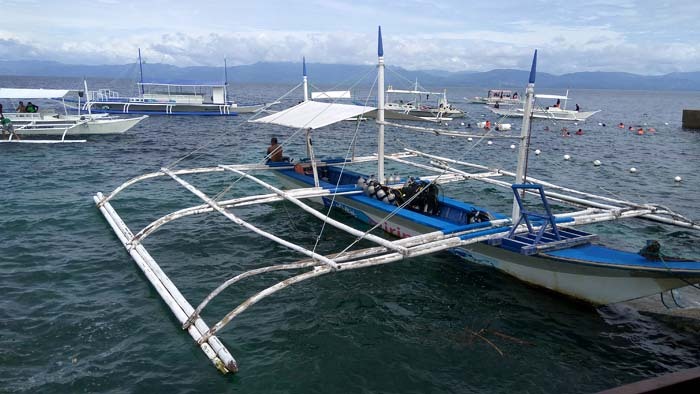 Because of Moalboal's abysmal depths just meters away from the shore, we weren't too far out. We could have stationed closer but there were too many tour boats anchored - it was a weekend. The current was strong. Visibility was poor but it didn't matter - it was all blue in any direction except when looking up. Water was warm and the sun was up. We were 6 pax altogether on two buoys. I didn't know anyone except for JP whom I've met less than 24 hours earlier. Everyone was at the intermediate level, comfortable to 40m depths. I was the only newbie - the excited 18m kid on the block. I was unfazed. Afterall, I didn't come to compete. The way I saw it, aside from JP, I had 4 other teachers to learn from. How cool is that? The first three dives, we all took turns on Free Immersion (use of a rope to pull down during a descent and again up on ascent, no finning). This is where I have the greatest ease. It was a warm-up. Looking down on my companions, I already noticed a few differences in our styles. 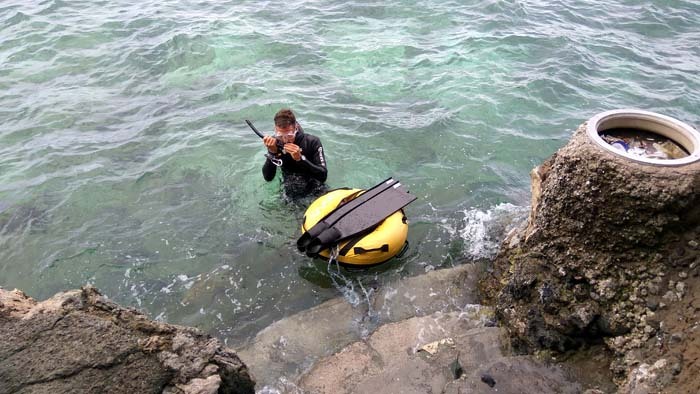 After every dive, JP would take the time to comment and critically assess the performance of the diver and point out areas for increased efficiency. This should now be corrected on the succeeding dive. It is interesting to note that while we were on the buoy, there was one big fish (Jack?) circling around the rope at about 12m. It was already deep but it still looked big, so it must have been really big! 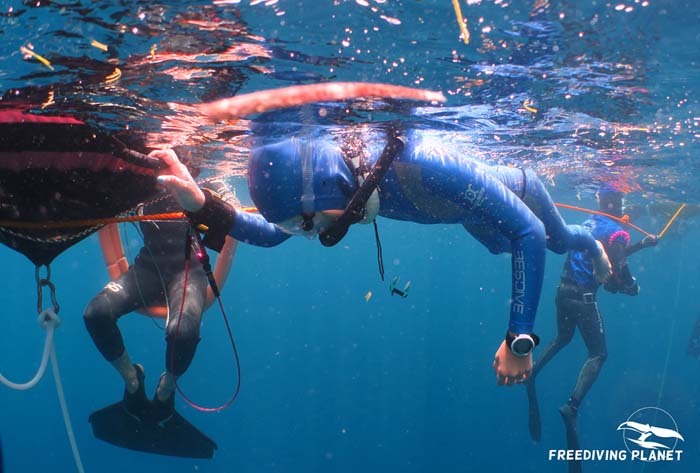 When fully warmed-up with the Free Immersion, we then continued with Constant Weight Freediving (finning down and up, holding the rope only to stop and begin the ascent). Finning required more effort than pulling on the rope, hence, increased fatigue resulting in shorter down time. 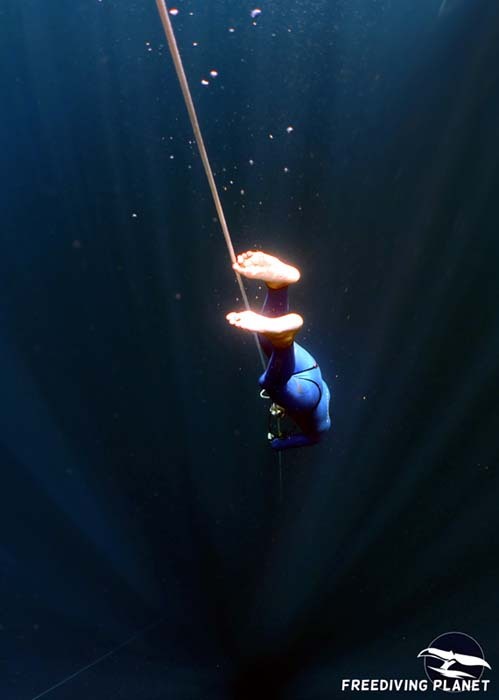 Using the rope as a visual guide (instead of actually pulling on it) and a strong current to contend with, I got disoriented on the initial attempt. JP had to signal me to abort and come up. Again, he gave me specific instructions on what to do - add more amplitude on my finning, don't look up and to stay close to the rope with constant eye contact on it. I did much better the second time around. Lastly, we did Rescue. My training was slightly different from their ways, so when I tried to adapt to their style (on the spot), I felt the learning curve. Good thing is, this is something I can practice with a friend on dry land. This was the last exercise. I was glad. After being on the water for 2.5 hours on just a rash-guard, I was already cold with my calf cramping from the rescue exercise. The practice was only 2.5 hours but I learned a lot - from the actual experience and JP's analytical coaching. Like a veteran teacher who has seen students come and go, he wasn't after depth in this practice. He wanted us to perfect our technique first - and that made a lot of sense. With good techique comes increased confidence and increased ability to meet the challenge. The depth will always be there for the taking when the time is right. 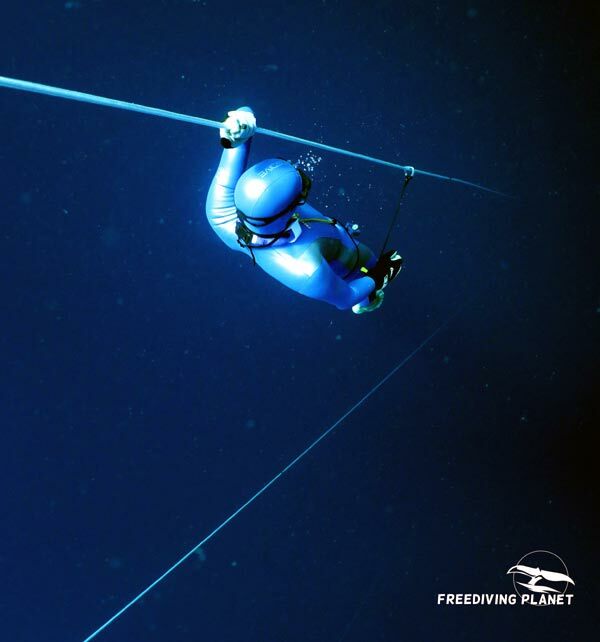 Thank you JP and thank you, Freediving-Planet! 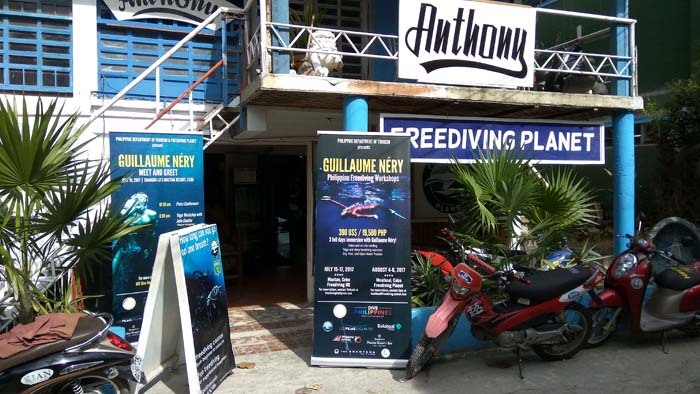 ps - If you want me to objectively write about a freedive experience in your dive shop, email me.